3. 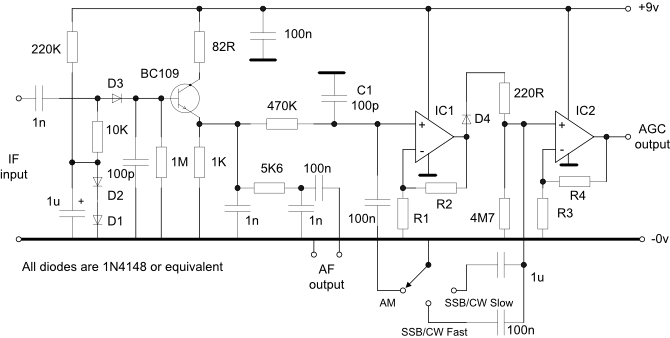 This circuit provides relatively simple AM detection using a diode detector followed by a solid state amplifier with a positive going AGC output with time constants for AM, CW and SSB. If the circuit is to be used for broadcast reception as well as speech only communications then the AM time constant may need to be increased to prevent bass audio frequencies from affecting the AGC - in which case increase the 22uF capacitor to at least 47uF. The gain of the two transistor AGC DC amplifier on the right hand side of the circuit is determined by the 82R and 5K6 resistors. The AF stage connected to the AF Output should have a high input impedance compared to the 5K6 RF filter resistor to avoid attenuation of the audio signal. The two BC214 devices could be replaced by a rail to rail CMOS op-amp (with appropriate biasing) which would also provide a lower AGC output impedance. This page contains a series of AM detectors, showing in addition how a control voltage for an AGC system may be obtained. 1. A basic detector using a single diode. The OA47 and OA90 germanium diodes will give the best sensitivity as they have the lowest conduction threshold of approximately 100mV but the worst temperature stability. The conduction threshold of silicon diodes like the 1N4148 is about 700mV and Schottky diodes like the HP2805 is about 400mV. This can be overcome by forward biasing the diode as shown in some of the following circuits but the bias should be temperature compensated, generally using the same type of semiconductor. The diode must see DC continuity to ground otherwise it will not work correctly. The time constant of the load see by the diode must be shorter than the period of the highest audio frequency otherwise distortion will occur. The DC output may be used, after filtering, to feed an AGC circuit. The classic crystal set is based on this type of detector - see here for more details. 2. The infinite impedance detector was often used in the days of valves as an AM detector and a semiconductor version is shown below. The conduction threshold of the base emitter silicon diode is overcome using a forward biased silicon diode to provide a temperature compensated bias supply. 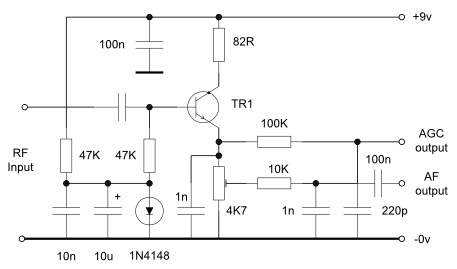 One slight disadvantage of this circuit is that it has a tendency to oscillate at high frequencies which can usually be cured by inserting a low value resistor, say 22R or 47R, in series with the base connection. The BC109 will be fine up to a few MHz but will need to be replaced with a suitable RF device for higher frequencies. 4. The following circuit uses the same detector as in (3) above but with a more flexible AGC arrangement. Rail to rail output CMOS op-amps like the CA3140 are used to remove the need for a negative supply. The gain of each op-amp circuit will be determined by the individual user’s requirements but if unity gain is required then omit resistors R1 and R3. The minimum AGC rise time for all modes is set by the 470K resistor and capacitor C1. On AM the rise and fall times are set by the 470K resistor and the 100n capacitor and should be just sufficient to prevent low audio frequencies from affecting the AGC voltage. 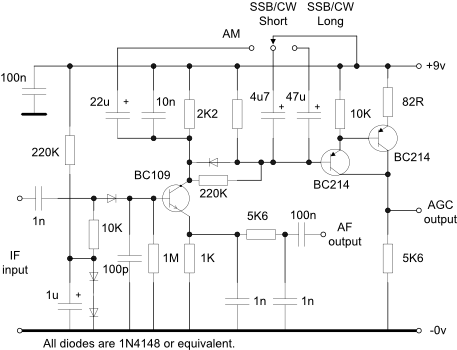 The AGC fall times on CW/SSB are set by the 4M7 resistor and the 1u or 100n capacitors sepending on the switch position. A ‘Hang’ facility has not been implemented but could be provided with some additional components. The non-inverting input of IC2 is an extremely high impedance point and may need protecting against leakage to and from the surrounding circuitry with wider spaced tracks and possibly a varnish covering. The timing capacitors should be high quality, non polarised, foil dielectric types for best results.